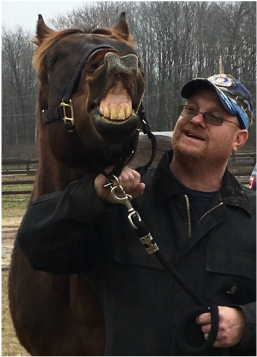 Out Side In’s Thoroughbred rescue program is looking for Veteran volunteers to help rehabilitate and re-train Thoroughbred race horses after their race career has ended and give them a second chance at life. The loyalty, reliability and motivation of US Veteran’s will make them invaluable partners in this program they may be able to relate to much of what these horses have experienced when coming off the track. Like many Veteran’s, especially those who have suffered from PTSD or other emotional difficulties, these horses often have issues of distrust, a heightened sense of ensuing danger, difficulty in social situations and challenges in acclimating to a new environment. Not only will the horses benefit greatly from their partnership with a Veteran, but we believe it will be mutually beneficial to our Veteran Volunteers. Not only will they be helping save a horse but we know that working with horses can improve a person’s sense of well-being. Just being around horses reduces stress levels and can decrease anxiety. No horse experience is necessary to participate in this program. Volunteers will be paired with a horse and will work with an equine specialist to learn everything they need to know about rehabilitating their horse. A volunteer will need to commit to a minimum of two hours, twice a week for three months. For more information or to register, please call (616) 844-0906 or email osiridingacademy@live.com. not in battle, but after they return home. everyone in a soldiers life. Equine Assisted Psychotherapy (EAP) is often a more appealing form of therapy because it mirrors other training and military experiences. Instead of sitting in an office talking (which often can feel confining and stigmatizing); in the arena or pasture with the horses, something active (physical and psychological) is experienced. Reconnecting with nature and establishing a relationship with a horse can often bypass defenses and allow one to be more open to addressing issues in their life. We accept all major insurances and have financial assistance for those in need. So, if you or your family are struggling to adjust, pre or post deployment, please contact us by clicking here or call us at(616) 844-0906.